early, almost production, model for photos and flying. This is a trick kite. The bridle comes set heavy, but has adjustment knots. I ended up moving the towpoint about 2" (I like lightly set kites). There is a 4 point bridle which can go between static or short turbo settings. There is a keeper line and the nose is very cleanly done. There is mylar in all the right spots. chalk that up to the fact that this is not a production model. The kite has a very fast reacting bridle and will spin stall to a landing dead easy. In fact, one must be a bit careful to not over spin the kite. the kite gets quite noisy. Leech lines are adjustable, but I left them alone. the kite is touchy and is difficult to fly really clean lines. It felt as if the kite was made to thrive in an unbalanced condition. and spectator more of a chance to see the individual moves. Cascades were noticeably slower than I would have expected. Barrel rolls felt controllable to the point that I got a few backspins on purpose. Not many kites will do both. Spin tricks were decent and yoyos slow enough to really enjoy. from any position were done. way better than I've done before. Don't know if it's me getting better or the kite. The Crackerjack only comes in blue and retails in the low $200s. enters into more of a trick category. see and appreciate, give this one a shot. Photos taken in my backyard. Kite flown at my local park. 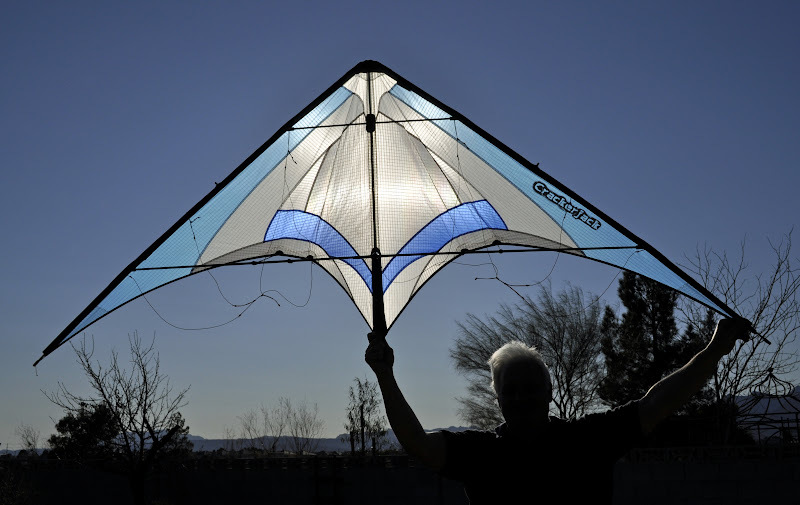 John, Thanks for the review I have been contemplating this kite for a while. I'm leaning pretty strongly towards a puchase. I know you said in your review you mostly have choppy winds, how do you feel it will handle precision wise in smoother winds? It is not a precision kite, period. the towpoints, precision would improve. Now go and put the bridle back on the factory marks and re-do your review. We need to get you a ruler with fractions indicated. You moved the bridle up Two Inches? Really? Maybe 1"-1.5" looking at the first picture. now. Back in a bit. You know, it's not a production model. Maybe where I moved it is now stock. I love the name - my grandfather used to call my cousins boyfriend that. I never knew if it was a affirmation or a criticism, but he was generally a very kind and gracious man, so I think it was somewhat of a compliment. I'm not telling the rest of you how to set your bridle. Just telling you the conditions for the review I did. Isn't that what a review is supposed to be? Tell the conditions of the test and do the test. I'll be able to get the kite to perform at Jim's level. Wait. Did I violate one of the unwritten rules? Don't move your bridle more than 1/4" from stock. Don't enter Virtual Freestyle if you aren't good enough. I know I took a lot of grief over that one. Don't worry, I'll not enter another one of those. I'm glad I have you guys around to keep me on the proper path. Thanks for the great review John, I can't wait to actually fly this kite. From your review it sounds like exactly what would fit in with my style of flying. Big wing, pitch happy and slow smooth rotations. I am glad you are enjoying the kite. HQ doesn't get nearly enough credit for some of their productions. The Infinity was a true gem and the Shadow has been an SUL Staple in a lot of kite bags. flew his Tekken and the on loan Crackerjack. I left the Crackerjack with Wayne so he could have a shot at it. His Slot Machines have really improved.